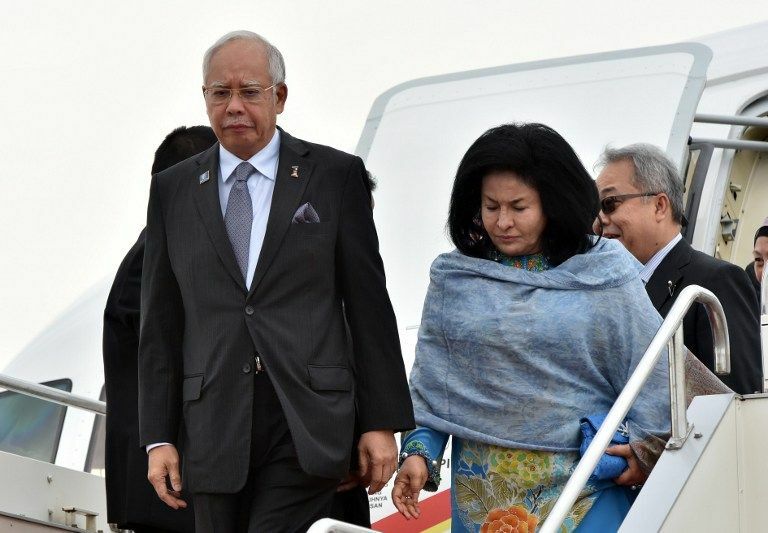 COMMENT: As the dust settles on yesterday’s highly anticipated showdown between the ex-premier and the current one, the official line has been that Prime Minister Najib Abdul Razak could not turn up for “security reasons”. 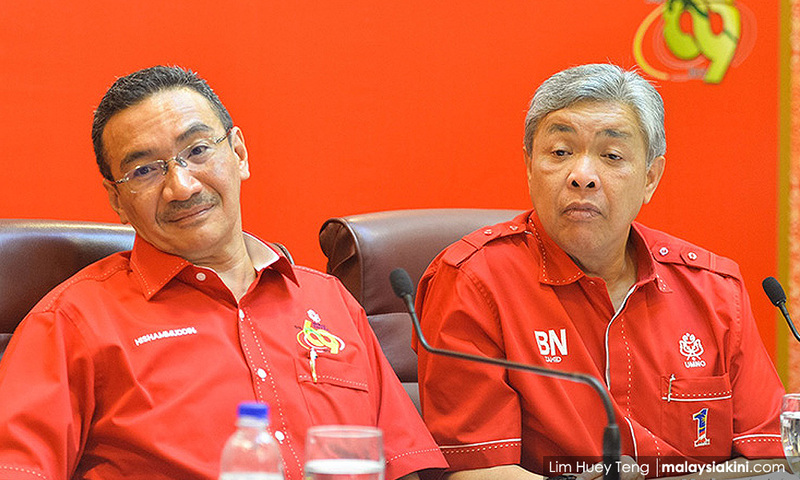 Even if the clash of words did not materialise, which instead fizzled into a truncated monologue by Dr Mahathir Mohamad, those who were at PWTC yesterday morning would agree there were grounds for concern. The situation did turn chaotic at the forum titled ‘Nothing to Hide: PM’s Dialogue with NGOs’. Journalists were shoved against the wall and tables, with some even losing their shoes, from all the pushing in the overflowing hall. The 2,000-strong crowd was angry too; they shouted and drowned out the emcee. But despite the jostling for space, the apparent chaos only came about after the emcee announced the Police decision to cancel the event. When Mahathir took advantage of Najib’s no-show to make his grand entrance into the hall with his supporters, the situation became even more chaotic, as the crowd cheered wildly.Police and security personnel then swung into the action and entered the hall, turning the din in the overcrowded venue into a pandemonium. But how exactly the emcee’s announcement could threaten ‘harmony’ is unclear. “We understand that the security authorities have met with the organiser and informed them about a scuffle outside the hall. An arrest was also made to identify who had (planned to) sabotage this programme,” Therefore, the organiser has been forced the cancel the event,” said the emcee at around 10.20am. 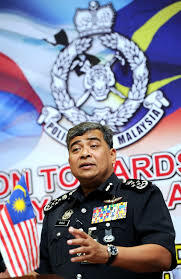 Inspector-General of Police Khalid Abu Bakar, in a Twitter posting, had said the cancellation was on the grounds of “public order” and to “maintain harmony”. Strangely, the Police Chief had instructed the event’s cancellation even before the scuffle happened. Khalid’s tweet was at 8.53 a.m but the commotion, which was witnessed by a Malaysiakini journalist, happened at 9.35am. Two men had quarreled outside the hall and a PWTC security personnel and Rela officer were seen grabbing the arms of one of the men and escorted him away. How a scuffle between two men could threaten such a high-profile event almost an hour after it happened remains a mystery. Ultimately, Najib’s public relations team needed to come up with a convincing reason for his no-show, which has unwittingly turned into a public relations disaster. The event was carefully prepped for the premier to show he had nothing to hide, but safe enough to insulate him from any bad press by barring the media from attending the dialogue after his arrival. The event was organised by UMNO-linked Malaysian Volunteer Lawyers Association (Sukaguam), whose chairperson Khairul Anwar Rahmat is Johor UMNO Youth Deputy Chief. 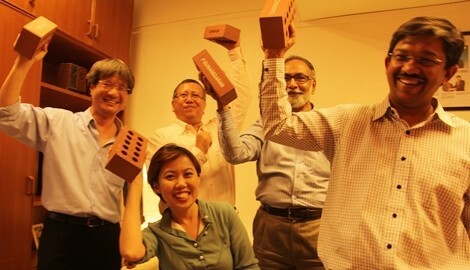 Those in attendance also told Malaysiakini – on condition of anonymity – that the government’s propaganda wing, the Special Affairs Department (JASA), had sent out invitations for the event to them. 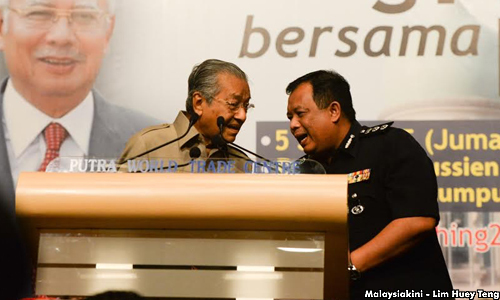 But Najib’s failure to turn up, allowing Mahathir – who was meant to be only one among 2,000 guests – to take over the podium and give an anti-Najib speech, does not bode well for the Prime Minister. And the Police’s move to stop Mahathir from speaking likely did more damage than good, neither did it lend credence to Police claim of security concerns for Najib. The organiser, which initially welcomed Mahathir and even photographed a seat reserved for the former premier and posted it on social media, later made a U-turn and claimed Mahathir was never invited. For now, the official line from the Prime Minister Office’s is to blame the Police, stating that Najib had to abide by Khalid’s instructions. The damage is done. How well Najib’s team can mitigate the blow will depend on how convinced the public is that the Prime Minister has indeed nothing to hide. 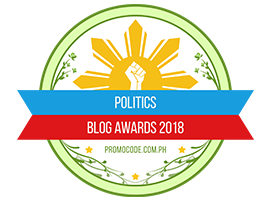 Posted in 1MDB Financial Scandal, civil society issues, Democracy, Dr Mahathir, Finance, Governance, Leadership, Malaysian Yoda, Najib Razak, Politics, UMNO. Prime Minister Najib Abdul Razak has received a royal lashing from Johor Crown Prince DYMM Tunku Ismail for not attending the dialogue session dubbed ‘Nothing to Hide’ this morning. “How can you have a dialogue called ‘Nothing2Hide’ featuring a person who has everything to hide? Obviously he won’t show up,” read the bi-lingual post on the Johor football team’s Facebook page. 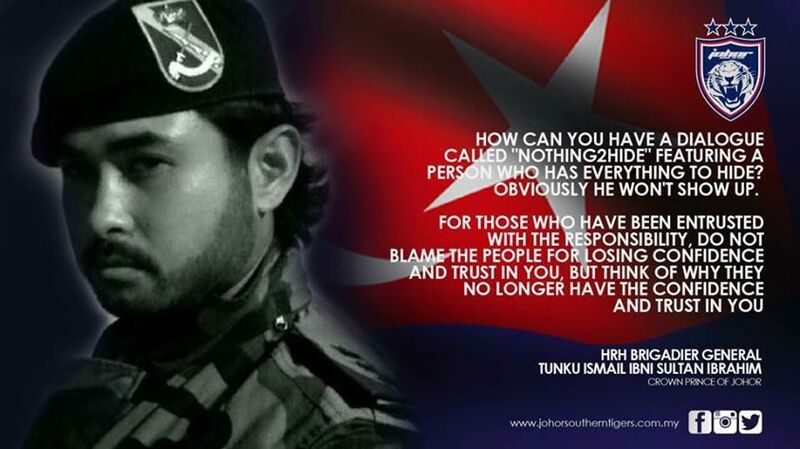 Tunku Ismail is the Johor Football Association President, and regularly posts his views on this Facebook page. Najib was scheduled to attend the dialogue at PWTC this morning but withdrew at the eleventh hour because the Police had cancelled the event due to security concerns. Tunku Ismail’s post also suggested that the Prime Minister could have lost the confidence of the people. For those who have been entrusted with the responsibility, do not blame the people for losing confidence and trust in you, but think of why they no longer have the confidence and trust in you,” he said. In an interesting twist, the scathing post was removed from the Facebook page for about an hour without any explanation, and this sparked off various speculations. However, the post was re-uploaded at about 7pm. The Crown Prince is known to be straight shooter, and had taken swipes at Youth and Sports Minister Khairy Jamaluddin and the Football Association of Malaysia (FAM) in the past. Najib has come under fire from former premier Dr Mahathir Mohamad, primarily over the handling of the 1MDB debacle. Mahathir had questioned how the Finance Ministry-owned company could have racked up RM42 billion in debt within just five years of operations. Najib avoided Dialogue with Mahathir and the NGOs at PWTC today. He has no sense of public duty and accountability. So he is not fit to be the Prime Minister of Malaysia. The Police gave us a stupid excuse. It is not safe for him to be at PWTC. He also took Najib to task for failing to shed details on the funds redeemed from 1MDB’s account in the Cayman Islands. Mahathir was present at the dialogue this morning. Posted in 1MDB Financial Scandal, Corruption, Governance, Leadership, Malaysian Yoda, Najib Razak, Public Accountability, UMNO.